The big surprise here is probably that Sticky Rice has not already received this designation. Another great Thai option in a town, and part of town, filled with them. There are numerous other favorable posts and passing comments that also indicate broad board support. And I think you can fairly say, beyond offering delicious food at incredible value, Sticky Rice has captured the board's imagination. Which isn't to say there aren't dissenting views; but on balance, I can say without equivocation, I think this is a great restaurant to have in my neighborhood. Last edited by Aaron Deacon on June 25th, 2006, 11:36 am, edited 1 time in total. I enthusiastically second this nomination! Sticky Rice is, for me, the perfect combination of fantastic food, low prices, and gracious staff. There are so many things I really like there (fried chicken, khao soi, jungle curry, pineapple fried rice, that SAUSAGE!) that I have a hard time convincing myself to try new things. But every time I have, I've not been let down. I find myself making up excuses to be in the neighborhood (which is nowhere near my home) just so I can eat at Sticky Rice. This place is truly a great neighborhood restaurant, and I thank Aaron for nominating it. Ok, I'll stick up for this one. Hopefully others will chime in too. There are many good options for Thai food in Chicago - and Stick Rice should be counted as one of them. More credit too for declaring that they specialize food from a specific region. Sadly (for me) I've only been there twice, but both times the food has been great! I don't claim any special Thai expertise (though I'm getting pretty good at cooking it from scratch). I've eaten at Sticky enough times that I've lost count and never been disappointed. Well, one time they burst my sausage, but it tasted pretty good anyway! I am surprised that Sticky Rice is not already a GNR, but the Thai category is a bit tough! Sticky Rice was among the first suggestions we took from LTH -- the other first restaurants that Griffin and I ran to based on our first readings of LTH were were TAC Quick and Casa de Samuel. There was clearly enough support available at that time to make us excited about all three of these! I think we first visited while we were still lurkers, or in pre-camera days, when we didn't feel we had much to add to the already glowing sentiment. In the context of this competition though, I just wanted to add a few cents. We have visited a number of times, brought friends, never been dissappointed and continually marvel that even with 2 appetizers and entrees we barely break $20. The northern sausage is a favorite, as is the duck with lychees. I wish I could remember the time of year we got the special soft shell crab appetizer. The day before we had ordered a spider roll at some semi-reputable sushi establishment and were so disappointed at the small amount of crab we got for 8-10 dollars. At Sticky Rice, our appetizer portion, in the $6 neighborhood, was a BASKET full of small lightly fried crabs. Almost the size of large crayfish -- I'd never seen soft shells this small -- but they were ample, perfectly fried, slightly crispy and delicious. In addition the consistently pleasant food experience, it also has the feel of a neighborhood place. And insects on the menu make our friends who order Pad Thai feel adventurous for just eating with us in this place! Please add my vote to Sticky Rice. I heartily support this nomination. Sticky Rice is the kind of place that makes me happy to live in Chicago. Soon after we discovered it, I put it on the shortlist of places to take my C-hound Brooklynite brother. They just don't have places like this in New York--a modestly priced, gastronomic wonderland in a comfy neighborhood setting. The standard Thai dishes are well-executed, and the less common "secret menu" dishes are a revelation. If this doesn't receive the GNR award, there oughta be an investigation! 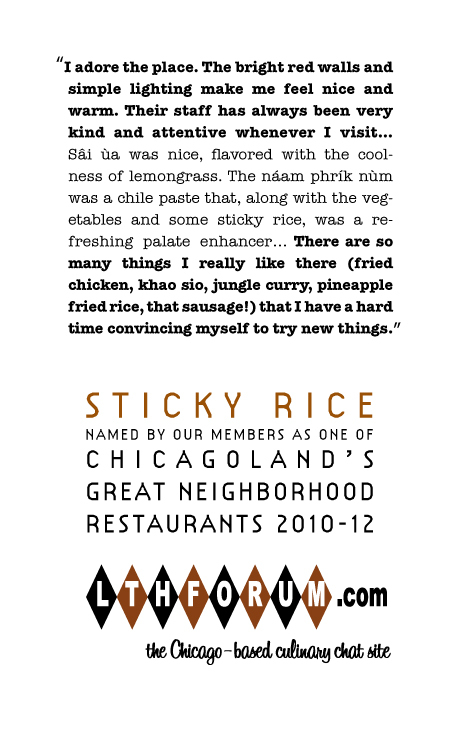 Sticky Rice has had recent support (see here.) I have not gone as often as I'd like, but the meals I have had resonate with me. I support a renewal of the Sticky Rice GNR. Sticky Rice continues to perform on a high level IMHO. I try to eat there every few weeks at the very least. With ErikM's massive translated menu I never seem to run out of new dishes to add into the mix of sure fire hits such as Northern Pork Stew, Spicy Jungle Stir-fry with Duck, and Chili and ginger stir fry with crispy pork. The Shrimp Paste Rice with Egg, Mango, Dried Shrimp, fried egg, and Sweet Pork is a excellent one dish lunch for one. The fact that you can order a large place of fried insects just puts Sticky Rice over the top in my book. Proof that they just keep getting better can be seen in the meal/photos we had just before X-mas with Tatterdemalion (as viewed in the link posted by The GP). Highly recommended for GNR renewal. I've probably had 50 meals from Sticky Rice since it was first annointed. It continues to be my go to delivery place, and one of the city's absolute best dining bargains. I enjoyed two remarkable meals at Sticky Rice in the past year, one before and one after the remodel. Quality and diversity (grubs, anyone?) of ingredients were commendable. Bright space and nice peeps. I'm for renewal. I've posted enough about Sticky Rice in the main threads that I can't imagine this is anything but superfluous... That said, it's one of my favorite places in all of Chicago and I would miss it dearly if I moved out of range. Absolutely yes on renewal. Agreed. Stick Rice is one of the Thai restaurants in our regular rotation. Excellent restaurant and, for me, a neighborhood one at that.